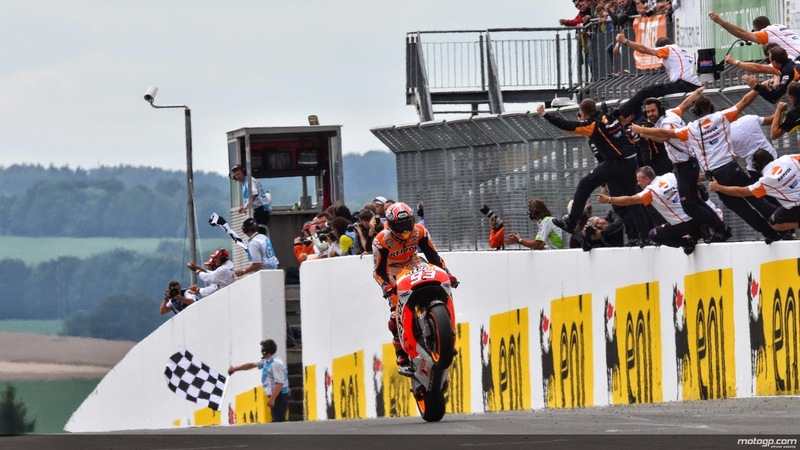 Tricky weather leads to a massive pit lane start and Marc Marquez storms to his 9th consecutive win in the German round of MotoGP. For the second time in succession the weather played hide and seek with the riders when the time came for the MotoGP race. While the weather was quite cloudy throughout Moto2, the rain finally arrived as the fastest riders in the world were preparing to go out for the 9th round on the MotoGP calendar. It was declared a WET RACE by the officials and everyone went out on their motorcycles laden with wet weather tyres. However, as the riders started lining up on the grid after the sighting lap, the rain had already started to stop. There were tense faces throughout the field as teams indulged in serious discussions with their respective riders about their next move. The only faces that were not tensed and had a smile stamped on them were the umbrella girls. While Marc Marquez was on pole as usual accompanied by his team mate Dani Pedrosa on the 2nd spot, LCR Honda’s Stefan Bradl occupied the final spot on the front row. This qualifying position put the German in a solid position to do a good race for his home GP. As it turned out, Stefan Bradl along with few other riders decided to start the race with the slicks as the weather was almost free of rain. Riders were provided one last chance to test the track conditions as the warm up lap started. Eventually, the remaining 14 out of 23 riders went into the pits and switched their motorcycles from wet weather tyres to the ones with slicks as quickly as possible. Watching such a large group of 14 riders all bunched up in the narrow pit lane was some sight. Valentino Rossi, Aleix Espargaro, Marc Marquez and few others occupied the front row and absolutely tightly packed. With only 9 riders on the starting grid and rest on the pit lane, the situation presented an even better opportunity for Stefan Bradl to actually fight for a podium finish at least. As the 30 laps race started, the LCR Honda rider led the small pack of some Open Class riders into turn 1. Riders from the pit lane were finally given a GO and Marc Marquez led the pack into turn 1 with Aleix Espargaro, Dani Pedrosa and Valentino Rossi all within touching distance of each other. The gap between Marquez and the race leader Bradl was around 8.5 seconds early on which was reduced to 7.7 seconds by the end of the first lap. The factory Hondas and Yamahas started their chase to hunt down the 9 riders in front. The current world champion was ahead of the rest followed closely by Pedrosa. In the next 4 to 5 laps both Repsol Honda riders had overtaken everyone and were breathing down the neck of Stefan Bradl. Five laps down the race and Marquez made a successful pass on Bradl, Pedrosa tried almost instantly but was unsuccessful. This gave Marquez an advantage of few more seconds over Pedrosa as Pedrosa took couple of corners more to overtake the German. Marquez and Pedrosa led the race from there on. Behind them, Movistar Yamaha’s Valentino Rossi and Jorge Lorenzo were making their way up as well and soon arrived behind Bradl. However, Lorenzo made a pass on Rossi and eventually was the first of the factory Yamaha riders to best Stefan Bradl. With 20 laps to go, Rossi made his move on Stefan Bradl as well and made it stick. For the remaining race, the positions of the front four remained same till the end of the race. Marc Marquez crossed the finish line in the winning position and became the first rider since Giacomo Agostini in 1971 to win first nine races in a year. The 21 years old Spaniard also became the first rider since Mick Doohan in 1997 to win nine races in a row. Behind him, Pedrosa tried his best and it appeared that he even came close to challenge Marquez for the win but in the end Pedroda had to settle for the 2nd place finishing almost 1.5 seconds behind his team mate. The factory Yamaha pair of Jorge Lorenzo and Valentino Rossi finished at 3rd and 4th positions respectively. Behind them, Andrea Iannone of Pramac Racing had quite a good race as he was the top Ducati rider of the day finishing in 5th. Forward Racing’s Aleix Espargaro, Tech 3 Yamaha’s Pol Espargaro, Factory Ducati’s Andrea Dovizioso, Gresini Honda’s Alvaro Bautista and Factory Ducati’s Cal Crutchlow rounded off the top 10. While Marc Marquez’s winning streak continues with his 9th win of the season, Stefan Bradl had the most disappointing race with the 16th position finish. Marc Marquez leads the world title with 225 points, Dani Pedrosa now second in championship with 148 points and Valentino Rossi at 141 points.